Another BILT North America has come and gone, and as per usual, it rocked eh! On this labor day Monday, it’s been a month since BILT NA 2017, so it seems like a good time to recap this year’s event. This year the BILT North America event was held on Aug. 3rd – 5th at the Westin Habour Castle in Toronto, and it was actually in Toronto right down town and on the water front. It was a busy conference this year for me as I had 3 sessions of my own, as well as helping out Jason Boehning his MEP Dynamo Lab as an assistant. I started off BILT NA this year with my lab “Dynamo – Everyone is doing it – Again”, which was the first lab of the conference. 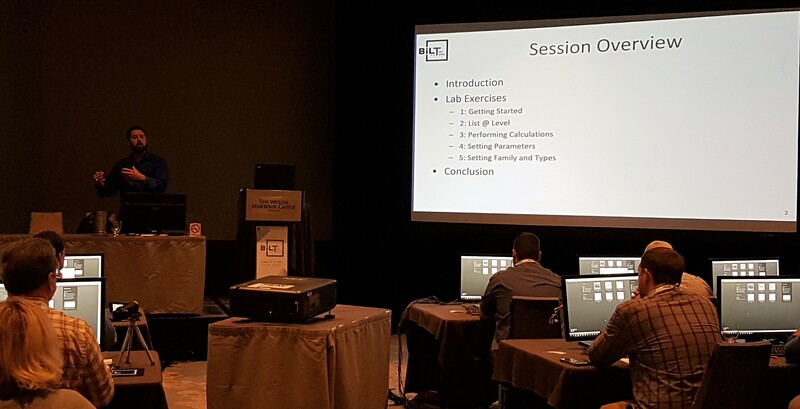 This year BILT used a zero client lab setup from HVE Connexions, and I learn right away that you want to make sure your datasets are of the correct version. I had forgotten to upgrade my Revit files from 2017 to Revit 2018, so when I had the 24 students all upgrade the files at once…bad move! This cause the server to max out the processor power of the lab, and meant that some students screens went blank as the system reset. Once the files did get upgraded and the labs came back online the lab went on pretty smooth, and I know I can say this because while I didn’t make the Top 10 Speakers, this lab did get an honorable mention in the Top 10 post. I truly believe this is because of the help from my lab assistants Ian Siegel, Jason Boehning, and Marcello Sgambelluri, as well as the awesome and very patient students from the lab! I would also like to point out that the folks at HVE and the IT folks tweaked the server for the Labs after that first sessions and I didn’t have to hear of any issues with the zero clients for the rest of the conference. The rest of my first day was spent in the labs with a double Dynamo lab from some Dynamo Heavy weights; Colin McCrone, Daniel Hurtubise, and John Pierson called “Dynamo for Architects… The Real Ones”. This is a jam packed double lab, and even with the two time slots (and working over break), we didn’t get all the examples in. However, the guys had us covered as they have a video for each example in their dataset so we can watch what we missed! I ended the day with a lab by Joe Banks, which ended up being the top lab (and overall session) of the conference, so it goes without saying that Joe knocked it out of the park! The session was called “294 Billion Window Types with 13 Families” which was a great advanced family lab. However, for me, the coolest thing was how Joe did his PowerPoint with some embedded video loops that allowed for him to be his own lab assistant! The day ended with the welcome event in the exhibit hall, which is always a great time to catch up with old and new friends and see what new and cool from all the exhibitors. The Simply Complex Podcast Crew: Don, Melissa, Marcello, Kelly, Carl – missing John & Jason. (we are going to do a retake at AU 2017 with everyone). My day 2 started performing lab assistant duties for Jason Boehning, in his lab “Dynamo Design Script for MEP”. Jason runs a great lab and really explains his examples well so there was much work for us lab assistants (John Pierson Helped out too). There is not always a lot of Dynamo content from the MEP view, and this we great stuff not too advanced, but everyday useful kind of stuff. I know that I have already used some Jason’s examples in my days to day Dynamo training sessions! Next on Day 2 was my Roundtable session “BIM as a Deliverable vs. BIM as a Process“. I had done this session last year at AU 2016, however, there the room was bigger with almost 100 people in attendance, this version with only 28 people was a much more reasonable size for a roundtable. There were great conversations during the session, and as in AU it seems that most people think that BIM is a process, however it is also clear that there are more issues that needed to be addressed in the world of BIM. I also want to thank Kimberly Fuhrman for taking notes during this session. 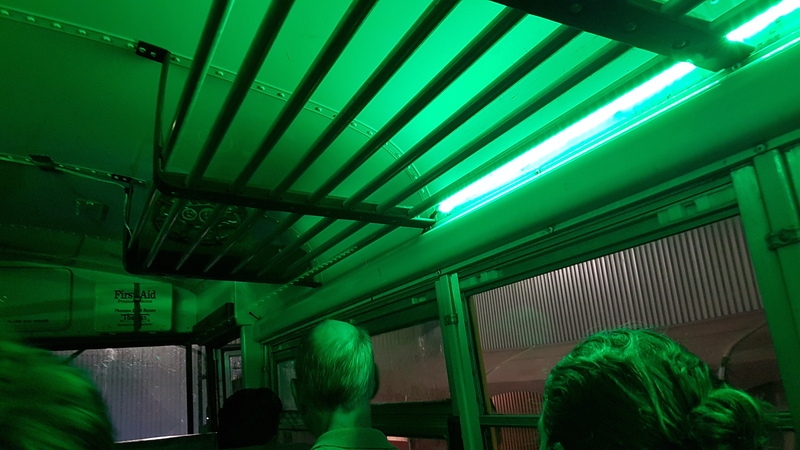 Day 2 ended with the “Friday Night Event” which this year as a trip on tricked out yellow school buses to the Ontario Science Centre for some fun, food, friends…and of course adult beverages. 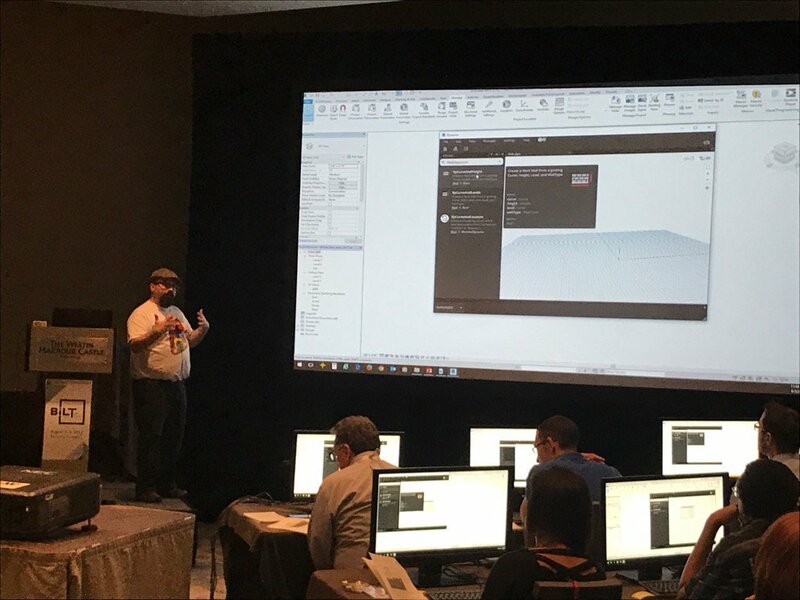 Day 3 started off with another lab, this time it was run by my BluePrints podcast co-host Bill Debevc for his Bluebeam lab called “Not a BIM lab, a Bluebeam one!”. While I was the unofficial lab assistant for this session, I didn’t need to get out of my seat as Bill had everything under control. If you were new to Bluebeam, or just wanted to learn some tips and tricks about Revu this was the perfect session for you. Lots of workflow tips, like hitting the ctrl key to switch between “zoom” scroll or “page” scroll. There was also the great swag, everyone got their own lab assistant in the form of a Lego mini-fig. 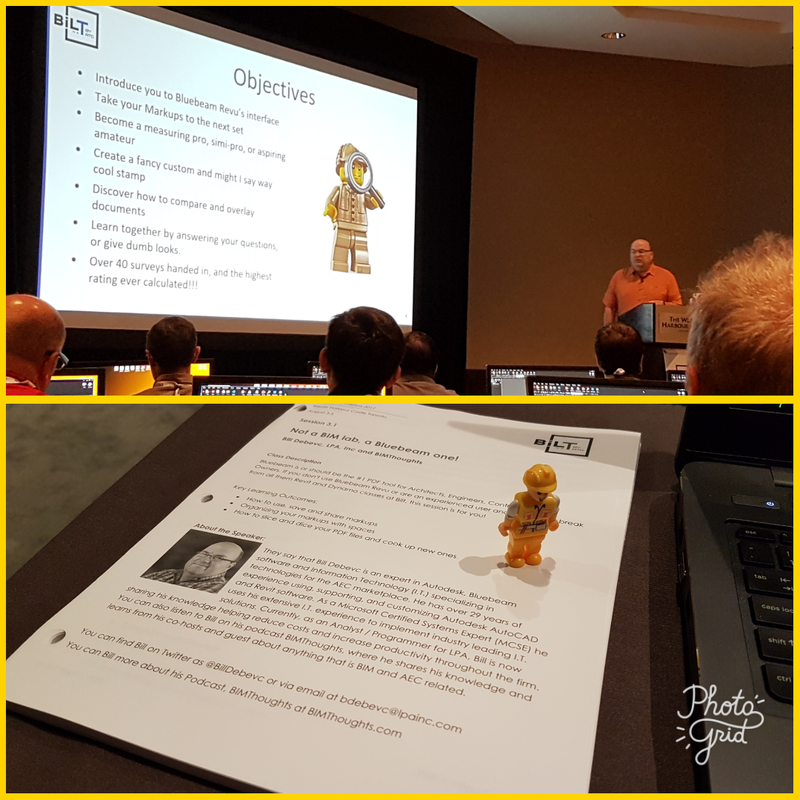 I really enjoyed the lab and picked up some good tips, and I don’t think I was the only one as Bill and this session ended up #2 on the Top 10 Speaker list for BILT NA 2017. 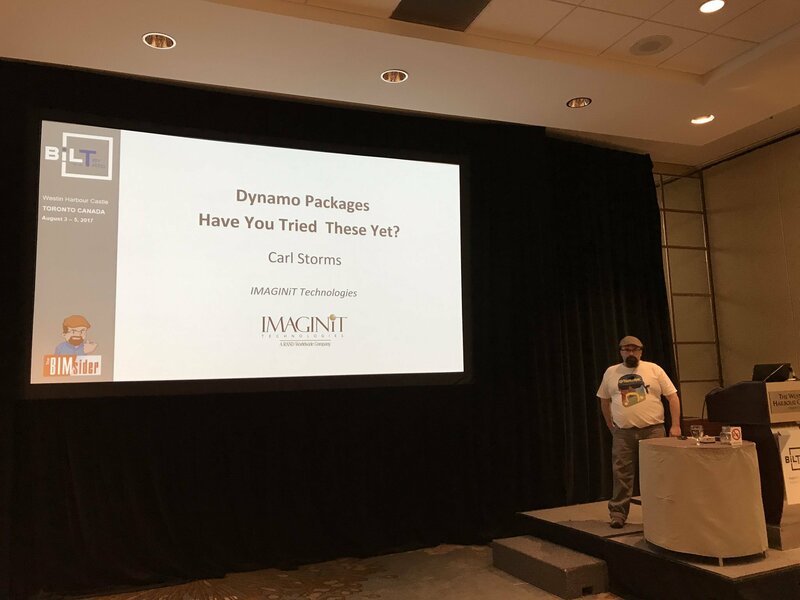 My last session of Day 3, and of the conference was my lecture “Dynamo Packages – Have You Tried These Yet?” This session was meant to be similar to my 25 Revit Add-in sessions I have done in past years, of course, this time focused on Dynamo Packages. However like my BILT began with some technical difficulty, it ended the same way with windows giving me the “Blue Screen Of Death” just 10 seconds into my session. Windows did let me restart and get the session underway, but 25 Dynamo packages we just a few too many as I missed the last 2. However, in a funny way, I think it worked out well as the class and the education portion of BILTNA ended on the Dynamo Cow from Marcello. Now that all the sessions were over it was time to relax and enjoy the Gala dinner. This was my 6th Gala dinner for RTC/BILT events. but my first time being part of the theme costume contest. Even though I didn’t win (I think Marcus aka the BIM Viking was robbed) it was fun to be part of it! And that was all she wrote for BILT North America 2017, now the hard part waiting the 339 days until BILT NA 2018. If my recap of BILT NA 2017 and how much fun it was and all the cool stuff you learn and awesome people you meet is not enough to get you to sign up for BILT NA 2018 then maybe some of these other Blog posts about BILT North America 2017 will do the trick. Well, I think you get the idea, people who attend BILT LOVE IT, and those that have been in the past and couldn’t make it this year missed it. So start planning for BILT NA 2018 now and I hope to see you next year in St. Louis, Missouri, USA Aug. 9th – 11th, 2018. Or the 6th – 11th if you are taking in any of the pre-conference events like BCS, DTS or Data Day.